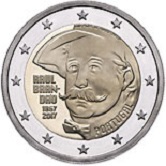 The coin celebrates the 150th birthday of the writer Raul Brandão. The works of Brandão are renowned for their honest representation of the simple and barren life of peasants and fishermen in Portugal. BRANDÃO. On the left of the inner circle – eight to nine o’clock – is the inscription “RAUL BRANDÃO" together with the dates 1867 and 2017. Between five and four o’clock is the name of the issuing country “PORTUGAL” and at the top (twelve to two o’clock) is an inscription in a small script showing the name of the designer and the mint mark – “LUSI FILIPE DEABREU INMC”.